If you remember seeing the 1971 Stanley Kubrick film A Clockwork Orange and might have possibly read Anthony Burgess’s chilling version of a dystopian society in England, this play should be on your must-view list. You’ll completely understand the plot and be enthralled by the energetic, theatrical treatment given it Off-Broadway at the New World Stages. If you’re a newbie to the story, you might want to grab a copy of Burgess’s landmark book with its glossary in the back pages and read a bit to prepare you for the play. The experience is somewhat like seeing a Shakespearean play for the first time: it takes you a while to understand what’s being spoken and to follow the story line. Little Alex and his band of delinquents are committing mayhem throughout England, responsible for a good deal of the “ultra-violence” so prevalent during this time period. In the movie, the establishing shots occur over a much longer time frame than in the play, making it easier to understand the underlying threat to society that this gang poses. Here, the set-up is quick, and the ensuing events are also fairly quick. The general result is clear, but it will take some paying attention to follow. 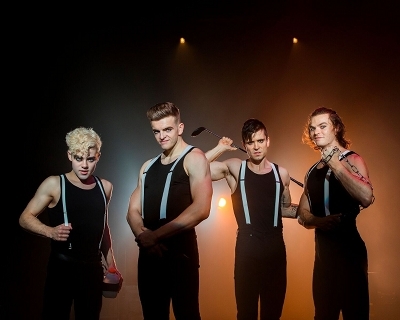 Additionally, Burgess has created his own language for droogies Alex, Dim, Georgie and Billy Boy. It’s a mix of Russian and English, morphed into words that Alex frequently uses as verbs, nouns, and situational descriptors. That’s where having some familiarity with the book’s glossary is useful. I speak Russian and could figure out what the words meant, but they will sound like gibberish to most. The comparisons between the movie and the show are notable, with some exceptions. This version, brought over by director Alexandra Spencer-Jones of London, is even more stylized than the movie (which was already visually arresting and somewhat surreal). In another creative digression from the movie, the all-male cast takes turns playing various roles, including some female ones, cued by a piece of clothing or a pair of shoes, for instance. Again, concentration is needed to follow these changes and to understand the role of music in the storyline. Alex is played by a British actor, Jonno Davies, with a background in Shakespeare at London’s West End. Others in the cast hail from the US and include Broadway veterans Matt Doyle (The Book of Mormon, War Horse, Spring Awakening) and Jordon Bondurant (A Gentleman’s Guide to Love and Murder, Mamma Mia!) as two of Alex’s counterparts in crime. 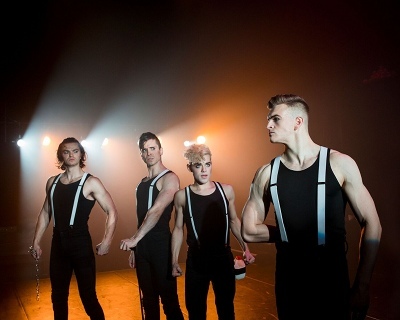 The ensemble is also the most physically fit group of performers that I’ve seen together on a stage, using striking choreography to tell significant parts of the tale. This entry was posted on Sunday, October 1st, 2017 at 11:38 pm	and is filed under Stuff to Do. You can follow any responses to this entry through the RSS 2.0 feed. You can leave a response, or trackback from your own site.